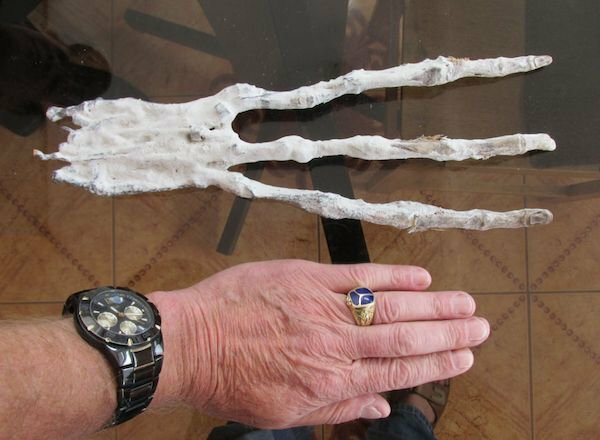 Home » Alien Hand Confirmed With Xray As Non Human Found In Desert Cave of Peru, Video, UFO Sighting News. This alien hand seems impossible, but X-rays confirm that real bones are below the skin. Humans have three bones in each finger area, yet this has 6 bones, so we know its not human. DNA results cannot tell us its an alien since we have no aliens to compare it too. Instead DNA results will only say the DNA doesn’t match any known species. Sure there is a skull, but it looks to be the size of an infant if it’s the same species as the hand, however several different kinds of aliens may have been working together and died in the Cusco cave tunnel where it was found. New Alien Mummy Discovered In Peru Near Nazca Lines?